Oxidative stress and inflammatory response are important elements of Alzheimer's disease (AD) pathogenesis, but the role of redox signaling cascade and its cross-talk with inflammatory mediators have not been elucidated in details in this disorder. The review summarizes the facts about redox-signaling cascade in the cells operating through an array of kinases, phosphatases and transcription factors and their downstream components. 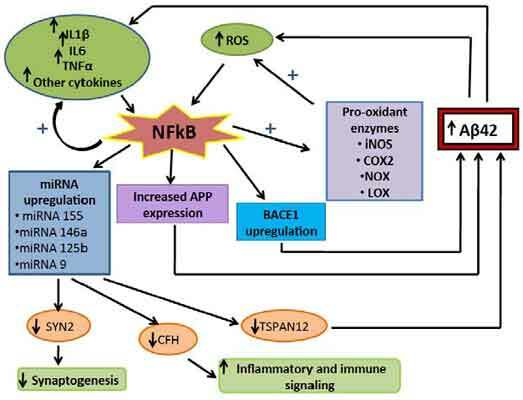 The biology of NF-κB and its activation by reactive oxygen species (ROS) and proinflammatory cytokines in the pathogenesis of AD have been specially highlighted citing evidence both from post-mortem studies in AD brain and experimental research in animal or cell-based models of AD. The possibility of identifying new disease-modifying drugs for AD targeting NF-κBsignaling cascade has been discussed in the end. Alzheimer’s disease, Amyloid beta, Cytokines, NF-κB, Oxidative stress, Redox signaling. Department of Biochemistry, Institute of Post Graduate Medical and Educational Research, 244, AJC Bose Road, Kolkata-700020, India.